Successful writing is about more than putting pen to paper, or finger to keyboard, as bestselling author Fiona Walker knows only too well. Here she offers her advice for ensuring your work has the best possible chance of being published. I knew nothing about publishing when I fired off my first novel to literary agents. I had never joined a writers’ circle or sought advice about writing. I had no idea how hard it usually is to get into print. If I had, I might never have tried. Ignorance was bliss. Writing was bliss. That was all I knew. I only really sent it off because my family and friends – to whom I had foolishly confessed what I was doing, kept asking if I had found a publisher yet. * In most cases, send the first three chapters, a brief synopsis (two pages max and a covering letter with some personal details. * Send white loose leaf A4 – no binders. * Present the work in a straightforward font, double-line spaced. * Print material on one side of the (numbered) page only. * Agents generally prefer to be targeted one at a time. So what did I do? I compiled my favourite chapters (one, three, nine and 18 as I recall), single-line spaced, bound in natty plastic spines. I added a 37-page synopsis and a self-deprecating letter explaining that I was overweight and my novel was 300,000 words long (it was actually longer). I sent this to five lucky agents concurrently. One sent it back by return with a note saying ‘not seeking new clients’, one rejected it as ‘unreadable’, one asked for a reading fee as it was ‘rather long’ and two agents called on the same day saying they wanted to represent me. 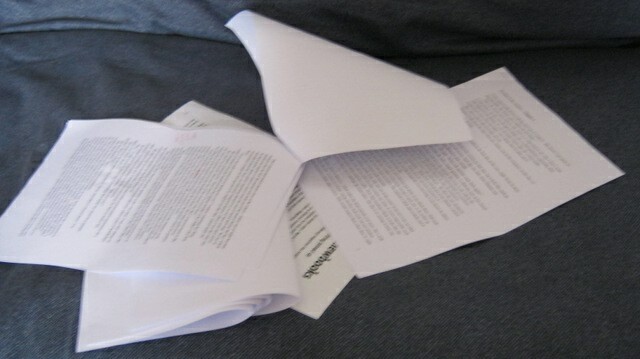 Within a week, I had signed a two-book contract with Hodder and Stoughton that made me a full-time novelist. * Write what you want to read. * Believe utterly in your characters. * Never forget where the plot is going. * If something doesn’t work, rework it until it does. * Having finished it, warts and all, take a break. Then go back and tweak it until you fingers ache. * Really, really enjoy writing it. * Always put writing first, dreams of publication second. That’s how I still do it. It works for me. Yet everybody writes differently, with a unique voice, and telling somebody how to write fiction is like telling somebody how to talk. How dull if we all spoke the same way. Ergo, my only real advice is to write from the heart. Whether your work becomes a bestseller or you gather the largest collection of rejection letters in existence, never forget why you write. Have fun! Fiona Walker is the author of a stream of bestselling contemporary romantic comedy novels. While working briefly in advertising, she became addicted escapist fiction, and then tried writing her own. Her first effort, French Relations, was published by Coronet in 1995. Fiona’s latest novel is The Love Letter. Find out more about Fiona Walker at www.fionawalker.com.